Vancouver, British Columbia--(Newsfile Corp. - February 12, 2019) - Cabral Gold Inc. (TSXV: CBR) (OTC Pink: CBGZF) ("Cabral" or the "Company") is pleased to announce an update of its initial drilling program, as well as assay results from rock chip and auger drilling sampling of the Quebra Bunda target at the Cuiú Cuiú Project, located in the state of Pará, in northern Brazil. Six diamond drill holes for a total of 549m have now been completed at four different locations at Machichie, the first drill target. Results are pending. Drilling is currently focused on testing the Machichie East Au-Mo-Cu target. A composite rock chip sample returned 3,727 g/t Au (119.8 oz/t Au) from a shear zone at the Quebra Bunda target. The result represents the highest-grade sample ever returned from either surface rock chip geochemical sampling or diamond drill programs at Cuiú Cuiú. The host structure at Quebra Bunda is 0.5 - 1m wide with an east-west strike. It has now been traced a minimum of 365m along strike to the east and west using saprolite auger gold and pathfinder element geochemistry, and remains open. The high-grade zone is associated with box-worked (after sulphide) quartz veins in the widening segment of the vein. The position corresponds to a prominent demagnetized corridor which parallels the trend of Cabral's MG (Moreira Gomes) deposit, located 1km to the south. The Quebra Bunda target and its structural extensions have not previously been drill-tested, with the nearest historical drilling 1km away. 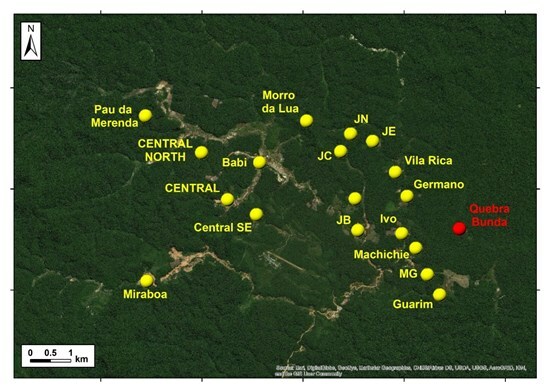 The Quebra Bunda target is situated 1km to the north of Cabral's MG resource (Figure 1). It is located in a geological domain adjacent to the NW trending Tocantinzinho Lineament where the Company has recently defined several new high-grade gold targets from rock chip and channel sampling programs. This prospective crustal block is associated with multiple parallel E-W trending structures, marked by corridors of demagnetization in the otherwise strongly magnetic granite basement. These structures are largely concealed beneath soil and transported cover. The artisanal workings locally penetrate the cover sequence and provide useful windows into the basement for sampling. The original alluvial workings date from the 1970's when gold was worked in the sediments manually by hand panning and sluicing. Recently, the pit was temporarily dewatered by the artisanal miners to access remnant alluvial material, which provided an opportunity for the Company to better access the available exposures of weathered bedrock on the southern side wide wall, where a subvertical shear zone had been identified. Channel sampling in the narrower upper part of the structure indicated the structure was gold-anomalous (0.12 - 0.25 g/t Au). The recognition of any mineralized structure in conjunction with alluvial workings in the Tapajos requires careful evaluation given the discovery history of deposits such as the Palito mine where high-grade structures can taper to have quite subtle surface expressions. The pit, when dewatered, provided an opportunity to view a better vertical section of the shear. The shear expanded to a width of 1m at depth and contained an increasing abundance of iron-staining and box-worked quartz veins (Figure 3). A composite rock chip sample across this lower part of the vein returned an exceptionally high-grade result of 3,727 g/t Au (119.8 oz/t Au). Alan Carter, President & CEO commented "We are encouraged by the drilling thus far at Cuiú Cuiú and the initial Machichie target and look forward to receiving the drill results. 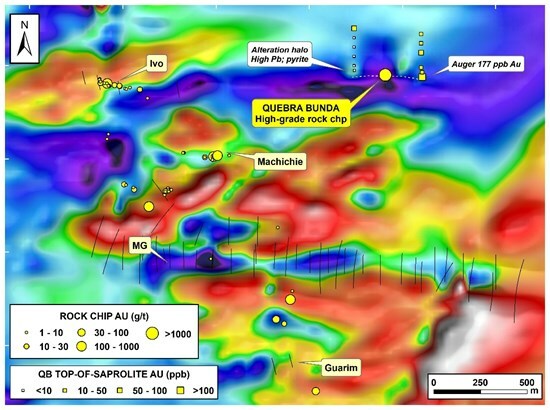 The recent results from the Quebra Bunda target, which is located 1km north of the Moreira Gomes deposit, also highlight the prospectivity of the E-W structural trends at Cuiú Cuiú and add further credence to the potential for high- grade mineralization associated with prominent E-W trends observed in the geophysical data". The Company owns the Cuiú Cuiú gold project, which covers the largest of the historical placer gold camps in the Tapajós region of northern Brazil, having yielded an estimated 2MMoz of gold from the overall 20-30MMoz gold produced during the Tapajós gold rush. Placer workings cover over 850ha on the property but are largely exhausted. 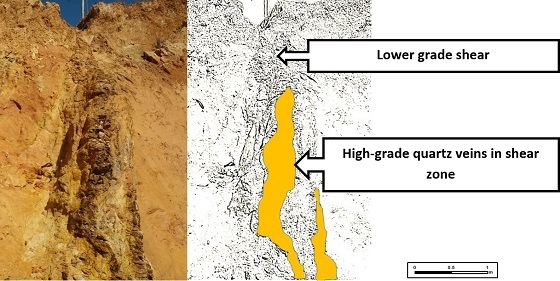 The few remaining artisanal workers now process gold from palaeo-valley placer deposits and in places exploit high-grade gold mineralization from quartz veins in saprolite (shallow highly weathered bedrock). The Company's current program is designed to improve understanding and expand existing prospects, evaluate newly identified discoveries, prioritize drill targets, and to build upon the existing resource inventory. This news release contains certain forward-looking information and forward-looking statements within the meaning of applicable securities legislation (collectively "forward-looking statements"). The use of the words "will", "expected" and similar expressions are intended to identify forward-looking statements. These statements involve known and unknown risks, uncertainties and other factors that may cause actual results or events to differ materially from those anticipated in such forward-looking statements. Such forward-looking statements should not be unduly relied upon. This news release contains forward-looking statements and assumptions pertaining to the following: strategic plans and future operations, and results of exploration. Actual results achieved may vary from the information provided herein as a result of numerous known and unknown risks and uncertainties and other factors. The Company believes the expectations reflected in those forward-looking statements are reasonable, but no assurance can be given that these expectations will prove to be correct.